A new year brings new opportunities and for Optimist Clubs under the Optimist International umbrella, a new year means it is time to finalize all preparations for the Optimist International Scholarship Programs. 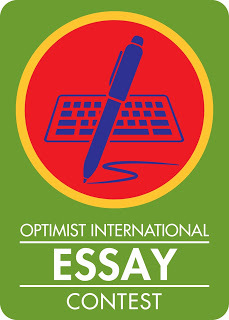 The first program that takes place each year is the Optimist International Essay Contest. As all programs do, it begins at the Optimist Club level. Each year, students are invited to write an essay of 700 to 800 words on the official topic and submit it to their local Optimist Club. The Optimist Club collects the essays, judges them, and forwards the winning essay to the District Chairperson. At the District level, the winning essay wins a $2,500 scholarship. The 2018-2019 topic is "When all the world's problems are solved, is optimism still necessary?" The application may be found here. The 2018-2019 PNW District Chairperson is Monique Connors. Winning Optimist Club essays must be in Monique's hands or email inbox no later than February 28, 2019. The cost for the club entry is $50 USD. Please contact Monique with any questions your Optimist Club may have.